"Horsefly" redirects here. For other uses, see Horsefly (disambiguation). Horse-flies or horseflies (for other names, see common names) are true flies in the family Tabanidae in the insect order Diptera. They are often large and agile in flight, and the females bite animals, including humans, to obtain blood. They prefer to fly in sunlight, avoiding dark and shady areas, and are inactive at night. They are cosmopolitan, with only a few isolated islands and polar regions uninhabited. Horse-flies have appeared in literature since Aeschylus in Ancient Greece mentioned them driving people to madness through their persistent pursuit. Apart from the common name "horse-flies", broad categories of biting, bloodsucking Tabanidae are known by a large number of common names. The word "Tabanus" was first recorded by Pliny the Younger and has survived as the generic name. In general, country-folk did not distinguish between the various biting insects that irritated their cattle and called them all "gad-flies", from the word "gad" meaning a spike. The most common name is "cleg[g]", "gleg" or "clag", which comes from Old Norse and may have originated from the Vikings. Other names such as "stouts" refer to the wide bodies of the insects and "dun-flies" to their sombre colouring. Chrysops species are known as "deer-flies", perhaps because of their abundance on moorland where deer roam, and "buffalo-flies", "moose-flies" and "elephant-flies" emanate from other parts of the world where these animals are found. In North America they are known as "breeze-flies", and in Australia, some are known as "March flies", a name used in other Anglophonic countries to refer to the non-bloodsucking Bibionidae. 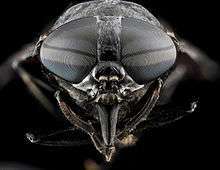 Adult tabanids are large flies with prominent compound eyes, short antennae composed of three segments, and wide bodies. In females, the eyes are widely separated but in males, they are almost touching; they are often patterned and brightly coloured in life but appear dull in preserved specimens. The terminal segment of the antennae is pointed and is annulated, appearing to be made up of several tapering rings. There are no hairs or arista arising from the antennae. Both head and thorax are clad in short hairs but there are no bristles on the body. The membranous forewings are clear, uniformly shaded grey or brown, or patterned in some species; they have a basal lobe (or calypter) that covers the modified knob-like hindwings or halteres. The tips of the legs have two lobes on the sides (pulvilli) and a central lobe or empodium in addition to two claws that enable them to grip surfaces. Species recognition is based on details of head structures (antennae, frons, and maxillae), the wing venation and the body patterning; minute variations of surface structure cause subtle alterations of the overlying hairs which alters the appearance of the body. Tabanid species range from medium-sized to very large, robust insects. Most have a body length between 5 and 25 mm (0.2 and 1.0 in), with the largest having a wingspan of 60 mm (2.4 in). Deer flies in the genus Chrysops are up to 10 mm (0.4 in) long, have yellow to black bodies and striped abdomens and have membranous wings with dark patches. 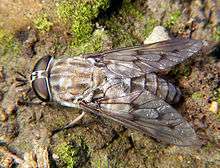 Horse-flies (genus Tabanus) are larger, up to 25 mm (1 in) in length and are mostly dark brown or black, with dark eyes, often with a metallic sheen. Yellow flies (genus Diachlorus) are similar in shape to deer flies but have yellowish bodies and the eyes are purplish-black with a green sheen. Some species in the subfamily Pangoniinae have an exceptionally long proboscis (tubular mouthpart). The larvae are long and cylindrical with small heads and twelve body segments. They have rings of tubercles (warty outgrowths) known as pseudopods around the segments, and also bands of short setae (bristles). The posterior tip of each larva has a breathing siphon and a bulbous area known as Graber's organ. The outlines of the adult insect's head and wings are visible through the pupa, which has seven movable abdominal segments, all except the front one of which bears a band of setae. The posterior end of the pupa bears a group of spine-like tubercles. Some species, such as deer flies and the Australian March flies, are known for being extremely noisy during flight, though clegs, for example, fly quietly and bite with little warning. Tabanids are agile fliers; Hybomitra have been observed to perform aerial manoeuvres similar to those performed by fighter jets, such as the Immelmann turn. Horse-flies are found worldwide, except for the polar regions, but they are absent from some islands such as Greenland, Iceland, and Hawaii. The genera Tabanus, Chrysops, and Haematopota all occur in temperate, subtropical and tropical locations, but Haematopota are absent from Australia and South America. Horse-flies mostly occur in warm areas with suitable moist locations for breeding, but also occupy a wide range of habitats from deserts to Alpine meadows. They are found from sea level to at least 3,300 metres (10,800 ft). The first record of a tabanid comes from the Late Jurassic of China, and specimens from the Cretaceous have been found in England, Spain, and possibly South Africa. In the New World, the first discoveries date from the Miocene of Florissant, Colorado. These insects are recognisable as tabanids both from their mouthparts and their wing venation. Although the bloodsucking habit is associated with a long proboscis, a fossil insect that has elongated mouthparts is not necessarily a bloodsucker, as it may instead have fed on nectar. The ancestral tabanids may have co-evolved with the angiosperm plants on which they fed. With a necessity for high-protein food for egg production, the diet of early Tabanomorphs was probably predatory, and from this the bloodsucking habit may have evolved. In the Santana Formation in Brazil, no mammals have been found, so the fossil tabanids found there likely fed on reptiles. Cold bloodsucking probably preceded warm bloodsucking, but some dinosaurs are postulated to have been warm-blooded and may have been early hosts for the horse-flies. The Tabanidae are true flies and members of the insect order Diptera. With the families Athericidae, Pelecorhynchidae and Oreoleptidae, Tabanidae are classified in the superfamily Tabanoidea. Along with Rhagionoidea, this superfamily makes up the infraorder Tabanomorpha. Tabanoid families seem to be united by the presence of a venom canal in the mandible of the larvae. Worldwide, about 4,455 species of Tabanidae have been described, over 1,300 of them in the genus Tabanus. Tabanid identification is based mostly on adult morphological characters of the head, wing venation, and sometimes the last abdominal segment. The genitalia are very simple and do not provide clear species differentiation as in many other insect groups. In the past, most taxonomic treatments considered the family to be composed of three subfamilies: Pangoniinae (tribes Pangoniini, Philolichini, Scionini), Chrysopsinae (tribes Bouvieromyiini, Chrysopsini, Rhinomyzini), and Tabaninae (tribes Diachlorini, Haematopotini, Tabanini). Some treatments increased this to five subfamilies, adding the subfamily Adersiinae, with the single genus Adersia, and the subfamily Scepcidinae, with the two genera Braunsiomyia and Scepsis. A 2015 study by Morita et al. using nucleotide data, aimed to clarify the phylogeny of Tabanidae and supports there being three subfamilies. The subfamilies Pangoniinae and Tabaninae were shown to be monophyletic. The tribes Philolichini, Chrysopsini, Rhinomyzini and Haematopotini were found to be monophyletic, with Scionini also being monophyletic apart from the difficult-to-place genus Goniops. Adersia was recovered within Pangoniini as were the genera previously placed in Scepcidinae, and Mycteromyia and Goniops were recovered within Chrysopsini. The Tabaninae lack ocelli (simple eyes) and have no spurs on the tips of their hind tibiae. In the Pangoniinae, ocelli are present and the antennal flagellum (whip-like structure) usually has eight annuli (or rings). In the Chrysopsinae, the antennal flagellum has a basal plate and the flagellum has four annuli. Females have a shining callus on the frons (front of the head between the eyes). The Adersiinae have a divided tergite on the ninth abdominal segment, and the Scepsidinae have highly reduced mouthparts. Members of the family Pelecorhynchidae were initially included in the Tabanidae and moved into the Rhagionidae before being elevated into a separate family. The infraorder Tabanomorpha share the blood-feeding habit as a common primitive character, although this is restricted to the female. 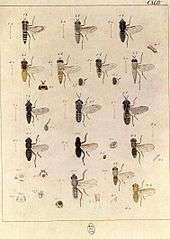 Two well-known genera are the common horse-flies, Tabanus, named by Swedish taxonomist Carl Linnaeus in 1758, and the deer flies, Chrysops, named by the German entomologist Johann Wilhelm Meigen in 1802. Meigen did pioneering research on flies and was the author of Die Fliegen (Flies); he gave the name Haematopota, blood-drinker, to another common genus of horse-flies. Adult horse-flies feed on nectar and plant exudates, and some are important pollinators of certain specialised flowers; several South African and Asian species in the Pangoniinae have spectacularly long proboscises adapted for the extraction of nectar from flowers with long, narrow corolla tubes, such as Lapeirousia, and certain Pelargonium. Both males and females engage in nectar feeding, but in addition to this, females of most species are anautogenous, meaning they require a blood meal before they are able to reproduce effectively. To obtain the blood, the females bite animals, including humans, while the males are harmless. It takes the female about six days to fully digest its blood meal and after that it needs to find another host. It seems that the flies are attracted to a potential victim by its movement, warmth, and surface texture, and by the carbon dioxide it breathes out. The flies mainly choose large mammals such as cattle, horses, camels, and deer, but few are species specific. They have also been observed feeding on smaller mammals, birds, lizards and turtles, and even on animals that have recently died. Because their bite is irritating to the victim, they are often brushed off, and may have to visit multiple hosts to obtain sufficient blood. This behaviour means that they may carry disease-causing organisms from one host to another. Tabanus mouthparts: the sharp cutting stylets are on the right, the spongelike lapping part in the centre. 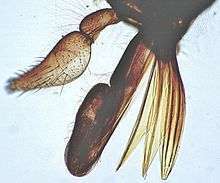 The mouthparts of females are of the usual Dipteran form and consist of a bundle of six chitinous stylets that, together with a fold of the flesh labium, form the proboscis. On either side of these are two maxillary palps. When the insect lands on an animal it grips the surface with its clawed feet, the labium is retracted, the head is thrust downwards and the stylets slice into the flesh. Some of these have sawing edges and muscles can move them from side-to-side to enlarge the wound. Saliva containing anticoagulant is injected into the wound to prevent clotting. The blood that flows from the wound is lapped up by another mouthpart which functions as a sponge. Horsefly bites can be painful for a day or more; fly saliva may provoke allergic reactions such as hives and difficulty with breathing. Tabanid bites can make life outdoors unpleasant for humans, and can reduce milk output in cattle. They are attracted by reflections from water which are polarized, making them a particular nuisance near swimming pools. Since tabanids prefer to be in sunshine, they normally avoid shaded places such as barns, and are inactive at night. Attack patterns vary with species: clegs fly silently and prefers to bite humans on the wrist or bare leg; large species of Tabanus buzz loudly, fly low, and bite ankles, legs or backs of knees; Chrysops fly somewhat higher, bite the back of the neck, and have a high buzzing note. It has been suggested that the striped hides of zebras have evolved to reduce their attractiveness to horse-flies and tsetse flies than either plain dark or plain white hides. The closer together the stripes, the fewer flies are visually attracted; the zebra's legs have particularly fine striping, and this is the shaded part of the body that is most likely to be bitten in other, unstriped equids. This does not preclude the possible use of stripes for other purposes such as signaling or camouflage. The horse guard wasp, Stictia carolina, catches horse-flies to provision its nest. The eggs of horse-flies are often attacked by tiny parasitic wasps, and the larvae are consumed by birds as well as being parasitised by tachinid flies, fungi and nematodes. Adult horse-flies are eaten by generalized predators such as birds, and some specialist predators, such as the horse guard wasp (a bembicinid wasp), also preferentially attack horse-flies, catching them to provision their nests. Mating often occurs in swarms, generally at landmarks such as hilltops. The season and time of day, and type of landmark, used for mating swarms is specific to particular species. Eggs are laid on stones or vegetation near water, in clusters of up to one thousand, especially on emergent water plants. The eggs are white at first but darken with age. They hatch after about six days, the emerging larvae using a special hatching spike to open the egg case. The larvae fall into the water or onto the moist ground below. Chrysops species develop in particularly wet locations while Tabanus species prefer drier places. The larvae are legless grubs, tapering at both ends. They have small heads and eleven or twelve segments and moult six to thirteen times over the course of up to a year or more. In temperate species, the larvae have a quiescent period during winter (diapause) while tropical species breed several times a year. In the majority of species they are white, but in some, they are greenish or brownish, and they often have dark bands on each segment. A respiratory siphon at the hind end allows the larvae to obtain air when submerged in water. Larvae of nearly all species are carnivorous, often cannibalistic in captivity, and consume worms, insect larvae, and arthropods. The larvae may be parasitized by nematodes, flies of the families Bombyliidae and Tachinidae; and Hymenoptera in the family Pteromalidae. When fully developed, the larvae move into drier soil near the surface of the ground to pupate. The pupae are brown and glossy, rounded at the head end and tapering at the other end. Wing and limb buds can be seen and each abdominal segment is fringed with short spines. After about two weeks, metamorphosis is complete, the pupal case splits along the thorax and the adult fly emerges. Males usually appear first, but when both sexes have emerged, mating takes place, courtship starting in the air and finishing on the ground. The female needs to feed on blood before depositing her egg mass. Johann Wilhelm Meigen's Europäischen Zweiflügeligen 1790, Plate CXCIV. Nos 7, 8 and 9 are Haematopota horse-flies, H. crassicornis, H. grandis and H. pluvialis respectively. Tabanids are known vectors for some blood-borne bacterial, viral, protozoan and worm diseases of mammals, such as the equine infectious anaemia virus and various species of Trypanosoma which cause diseases in animals and humans. Species of the genus Chrysops transmit the parasitic filarial worm Loa loa between humans, and tabanids are known to transmit anthrax among cattle and sheep, and tularemia between rabbits and humans. Blood loss is a common problem in some animals when large flies are abundant. There are anecdotal reports of horse-fly bites leading to fatal anaphylaxis in humans, an extremely rare occurrence. 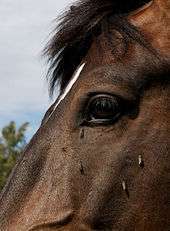 Controlling horse-flies is difficult. Malaise traps are most often used to capture them and these can be modified with the use of baits and attractants that include carbon dioxide or octenol. A dark shiny ball suspended below them that moves in the breeze can also attract them and forms a key part of a modified "Manitoba trap" that is used most often for trapping and sampling Tabanidae. Cattle can be treated with pour-on pyrethroids which may repel the flies, and fitting them with insecticide impregnated eartags or collars has had some success in killing the insects. Humans find horse-fly bites painful. There is usually a weal (raised area of skin) around the site and other symptoms may include urticaria (a rash), dizziness, weakness, wheezing, and angioedema (a temporary itchy, pink or red swelling occurring around the eyes or lips); a few people experience an allergic reaction. The site of the bite should be washed and a cold compress applied. Scratching the wound should be avoided and an antihistamine preparation can be applied. In most cases, the symptoms subside within a few hours but if the wound becomes infected, medical advice should be sought. Thomas Muffett described the horse-fly in his 1634 book Theatre of Insects. The physician and naturalist Thomas Muffet wrote that the horse-fly "carries before him a very hard, stiff, and well-compacted sting, with which he strikes through the Oxe his hide; he is in fashion like a great Fly, and forces the beasts for fear of him only to stand up to the belly in water, or else to betake themselves to wood sides, cool shades, and places where the wind blows through." The "Blue Tail Fly" in the eponymous song was probably the mourning horse-fly (Tabanus atratus), a tabanid with a blue-black abdomen common to the southeastern United States. 1 2 3 4 Marren, Peter; Mabey, Richard (2010). Bugs Britannica. Chatto & Windus. p. 312. ISBN 978-0-7011-8180-2. ↑ Cooke, Mordecai Cubitt; Taylor, John Eller (1866). Hardwicke's Science-gossip: An Illustrated Medium of Interchange and Gossip for Students and Lovers of Nature. Robert Hardwicke. p. 194. ↑ Doggett, Stephen L. (20 January 2010). "Biting flies". University of Sydney and Westmead Hospital: Department of Medical Entomology. Retrieved 30 July 2015. ↑ "Family Bibionidae: March Flies". BugGuide. Iowa State University. Retrieved 30 July 2015. 1 2 Cook, Gordon Charles; Zumla, Alimuddin (2009). Manson's Tropical Diseases. Elsevier. p. 1752. ISBN 1-4160-4470-1. 1 2 3 4 5 Squitier, Jason M. (1 April 2014). "Deer flies, yellow flies and horse flies". Featured Creatures. University of Florida. Retrieved 24 July 2015. ↑ Wilkerson, R.C. ; Butler, J.F. (1984). "The Immelman turn, a pursuit maneuver used by hovering male Hybomitra hinei wrighti (Diptera: Tabanidae". Annals of the Entomological Society of America. 77 (3): 293–295. doi:10.1093/aesa/77.3.293. 1 2 Middlekauff, Woodrow Wilson; Lane, Robert S. (1980). Adult and Immature Tabanidae (Diptera) of California. University of California Press. pp. 1–2. ISBN 978-0-520-09604-2. 1 2 Martins-Neto, Rafael Gioia (2003). "The fossil tabanids (Diptera Tabanidae): When they began to appreciate warm blood and when they began to transmit diseases?" (PDF). Mem Inst Oswaldo Krubs. 98 (1): 29–34. doi:10.1590/s0074-02762003000900006. PMID 12687759. 1 2 3 4 Morita, Shelah I.; Bayless, Keith M.; Yeates, David K.; Wiegmann, Brian M. (2015). "Molecular phylogeny of the horse flies: a framework for renewing tabanid taxonomy". Systematic Entomology. 41: 56. doi:10.1111/syen.12145. ↑ Mackerras, I.M. (1954). "The classification and distribution of Tabanidae (Díptera). I. General review". Australian Journal of Zoology. 2 (3): 431–454. doi:10.1071/zo9540431. ↑ Mackerras, I.M. (1955). "The classification and distribution of Tabanidae (Diptera). III. Subfamilies Scepsidinae and Chrysopinae". Australian Journal of Zoology. 3 (4): 583–633. doi:10.1071/ZO9550583. ↑ Morita, Shelah I. (2008). "A phylogeny of long-tongued horse flies (Diptera:Tabanidae:Philoliche) with the first cladistic review of higher relationships within the family". Invertebrate Systematics. 22 (3): 311–327. doi:10.1071/IS07005. 1 2 Eaton, Eric R.; Kaufman, Kenn (2007). "Deer flies and horse flies". Kaufman Field Guide to Insects of North America. Hillstar Editions. p. 284. ISBN 0-618-15310-1. ↑ Goldblatt, Peter; Manning, John C.; Bernhardt, Peter (1995). "Pollination biology of Lapeirousia subgenus Lapeirousia (Iridaceae) in southern Africa; floral divergence and adaptation for long-tongued fly pollination". Annals of the Missouri Botanical Garden. 82 (4): 517–534. doi:10.2307/2399833. ↑ Combs, J.K.; Pauw, A. (2009). "Preliminary evidence that the long-proboscid fly, Philoliche gulosa, pollinates Disa karooica and its proposed Batesian model Pelargonium stipulaceum". South African Journal of Botany. 75 (4): 757–761. doi:10.1016/j.sajb.2009.06.015. 1 2 3 "Horse Flies and Deer Flies". University of Kentucky. Retrieved 24 July 2015. ↑ Kazimírová, M.; Šulanová, M.; Kozánek, M.; Takáč, P.; Labuda, M.; Nuttall, P.A. (2001). "Identification of anticoagulant activities in salivary gland extracts of four horse-fly species (Diptera, Tabanidae)". Haemostasis. 31: 294–305. doi:10.1159/000048076. PMID 11910198. ↑ Thomas, Anthony (1 April 2012). "Horse Fly head" (PDF). Micscape Magazine. Microscopy-UK. Retrieved 25 July 2015. ↑ "Horse and Deer Flies". Medical Entomology. Purdue University. Retrieved 24 July 2015. ↑ Horváth, G; Majer, J; Horváth, L; Szivák, I; Kriska, G. (2008). "Ventral polarization vision in tabanids: horseflies and deer flies (Diptera: Tabanidae) are attracted to horizontally polarized light". Naturwissenschaften. 95 (11): 1093–1100. doi:10.1007/s00114-008-0425-5. PMID 18685822. 1 2 Marren, Peter; Mabey, Richard (2010). Bugs Britannica. Chatto & Windus. pp. 310–312. ISBN 978-0-7011-8180-2. ↑ Caro, Tim; Izzo, Amanda; Reiner, Robert C. Jr; Walker, Hannah; Stankowich, Theodore (2014). "The function of zebra stripes". Nature Communications. 5: 3535. doi:10.1038/ncomms4535. ↑ Egri, A.; Blaho, M.; Kriska, G.; Farkas, R.; Gyurkovszky, M.; Akesson, S.; Horvath, G. (2012). "Polarotactic tabanids find striped patterns with brightness and/or polarization modulation least attractive: An advantage of zebra stripes". Journal of Experimental Biology. 215 (5): 736. doi:10.1242/jeb.065540. ↑ Braga da Rosa; Gustavo A. (2006). "Predation of hilltopping horse-flies (Tabanidae) by birds in Brazil" (PDF). Ornitologia Neotropical. 17: 619–622. ↑ Wilkerson, R.C. ; Butler, J.F. ; Pechuman, L.L. (1985). "Swarming, hovering and mating behavior of male horse flies and deer flies (Diptera: Tabanidae)". Myia. 3: 515–546. ↑ Sullivan, Robert T. (1981). "Insect swarming and mating". Florida Entomologist. 64 (1): 44–65. doi:10.2307/3494600. 1 2 Cheng, Thomas C. (2012). General Parasitology. Elsevier Science. p. 660. ISBN 978-0-323-14010-2. ↑ Padgett, J.J.; Jacobsen, K.H. (2008). "Loiasis: African eye worm". Transactions of the Royal Society of Tropical Medicine and Hygiene. 102 (10): 983–9. doi:10.1016/j.trstmh.2008.03.022. PMID 18466939. ↑ Quercia, O.; Emiliani, F.; Foschi, F.G.; Stefanini, G.F. "The wasp-horsefly syndrome" (PDF). European Annals of Allergy and Clinical Immunology. 40 (3): 61–63. PMID 18717054. ↑ Williams, R. (26 July 2013). "Allergic reaction to horsefly bite kills father of four in seconds after anaphylactic shock". The Independent. Retrieved 9 September 2015. ↑ French, Frank E.; Kline, Daniel L. (1989). "l-Octen-3-ol, an effective attractant for Tabanidae (Diptera)". Journal of Medical Entomology. 26 (5): 459–461. doi:10.1093/jmedent/26.5.459. ↑ Axtell, R.C. ; Edwards, T.D. ; Dukes, J.C. (1975). 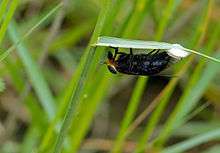 "Rigid canopy trap for Tabanidae (Diptera)". Journal of the Georgia Entomological Society. 10 (1): 64–67. ↑ "Symptoms of insect bites and stings". NHS Choices. 27 June 2014. Retrieved 30 September 2015. ↑ "Treating insect bites and stings". NHS Choices. 27 June 2014. Retrieved 30 September 2015. Look up horsefly in Wiktionary, the free dictionary.